InterSystems IRIS™ also provides specialized business service classes that use this adapter, and one of those might be suitable for your needs. If so, no programming would be needed. See the section “Connectivity Options” in Introducing Interoperability Productions. EnsLib.File.InboundAdapter finds a file in the configured location, reads the input, and sends the input as a stream to the associated business service. The business service, which you create and configure, uses this stream and communicates with the rest of the production. If the inbound file adapter finds multiple files in the configured location, it processes them in order of the time, earliest first, based on when the file was last modified. But the adapter ignores any fractional seconds in the time value. Consequently, if two or more files have a modified date-time differing only in the fractional second part of the time, the adapter can process them in any order. In your class, the ADAPTER parameter should equal EnsLib.File.InboundAdapter. The first argument to OnProcessInput() could instead be %FileBinaryStream, depending on the contents of the expected file. Studio provides a wizard that you can use to create a business service stub similar to the preceding. To access this wizard, click File > New and then click the Production tab. Then click Business Service and click OK. Note that the wizard provides a generic input argument. If you use the wizard, InterSystems recommends that you edit the method signature to use the specific input argument needed with this adapter; the input argument type should be %FileCharacterStream or %FileBinaryStream. In either case, pInput.Attributes("Filename") equals the name of the file. Examine the input file (pInput) and decide how to use it. 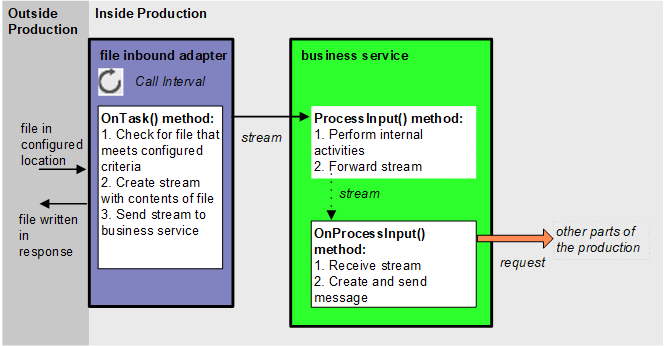 Within your business service, you might want to invoke the following instance methods of the adapter. Each method corresponds to an adapter setting; these methods provide the opportunity to make adjustments following a change in any setting. For detailed descriptions of each setting, see “Settings for the File Inbound Adapter,” later in this chapter. pInVal is the directory where the adapter should place a copy of each file after processing. path is the directory on the local server in which to look for files. path is the directory on the local server in which to place files while they are being processed. The file has a header. The header information is added to each transaction. The file experiences a number of transactions. The header and transaction XML structures are defined by the classes LBAPP.Header and LBAPP.Transaction (not shown). Some error-handling is shown, but not all. The method RejectBatch() is not shown. The transactions are submitted to the business process asynchronously, so there is no guarantee they are processed in order as they appear in the file. The entire transaction object is passed as the payload of each message to the business process. All of the transactions in one file are submitted as a single InterSystems IRIS session. The following code example shows a business service class that references the EnsLib.File.InboundAdapter.